No Hypertension! A Great Reminder of Why I Am Plant Based! Today, I had an appointment with a podiatrist. It was a routine visit but they had to update the medical charts at the office. The medical assistant asked all the routine medical questions and I of course said no to all of them! You know the questions... do you have diabetes, asthma, etc. Then she proceeded to check my blood pressure. I told her ahead of time that I usually have a higher blood pressure when in a doctor's office. She happily told me 120/70. Really? Even with anxiety, my blood pressure still was great! It made me think of how far I have come in six years. When I was heavy, my blood pressure was like 140/100. I was told I would need to take medication. To hear that my blood pressure is healthy made me so happy to be plant based. Now some of the readers might be saying, "wait a minute, you lost the weight before going plant based and your blood pressure went back to normal after losing the weight!" 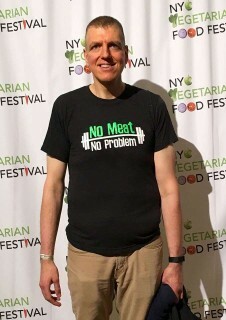 While it is true I wasn't completely plant based until September 6, 2016, I did crowd my body with healthy fruits and veggies for six years now. Although I ate minimal animal products back then, I was consuming so many nutrients from the plants, my problem with hypertension went away. It's a true testament of what a whole food plant based diet can do. Since going completely plant based (and vegan), I also noticed a number of other smaller problems went away, things like eczema on my hands, acne, canker sores and acid reflux. I don't believe I've had a single episode of heart burn in the past six years. I also rarely get colds now. When I do, they usually don't last longer than a few days and the symptoms are usually mild. The days of having colds that sometimes last for a month are gone. I don't miss how sick I used to get. I share this because I want others to realize the benefits of being plant based, beyond the weight loss. There are so many people I know of who have cured a number of illnesses just by eating plants. I cannot ever imagine going back to the Standard American Diet (S.A.D.). The energy and health benefits are reason enough to keep me on this path. And to think... my plant based diet back in 2016 was only going to be temporary! As I prepare for my abdominoplasty at the end of August, I know that plant based eating will help me heal way better than if I ate S.A.D. This is the only surgery I ever expect to do as I intend to be healthy and avoid chronic conditions that other people in my family developed over the years. I will be happy to have that reminder of my heavy days removed, as I want to look as healthy on the outside as I do on the inside. Your Team's Losing....But YOU Might be Gaining! You Can Cheat On Your Diet! Winner Winner Chicken Dinner? I won "Most Weight Lost" in the YMCA's Challenge! Why Put Off Losing Weight?